This is going to be a pretty fun blogging week because I just have so many great stories to share! We are back from Florida, where we just had the best time on our pre-baby vacay, and I also had the most beautiful baby shower on Sunday afternoon! I'll be blogging about that on Wednesday. Today I can't wait to share with you a chili that I made for us recently. I know the weather is going to start warming up soon, so please go ahead and make this while we still have some chilly nights! It was a huge hit in our home. I originally saw the recipe on Sing A New Song and I just slightly tweaked Melissa's recipe. Here's the version I went with. I'm pretty sure Ian would be fine if this were on a weekly menu rotation! Start off by shredding the chicken from your rotisserie chicken. If you'd rather cook and shred your own, go for it, but our grocery store sells rotisserie chickens for $4.99 on Sundays, and I just don't think you can beat that! So convenient. Saute the diced onion with a little oil until translucent. Add chicken, 1 package of ranch seasoning, and buffalo sauce to cover (eyeball it) and saute a few more minutes. 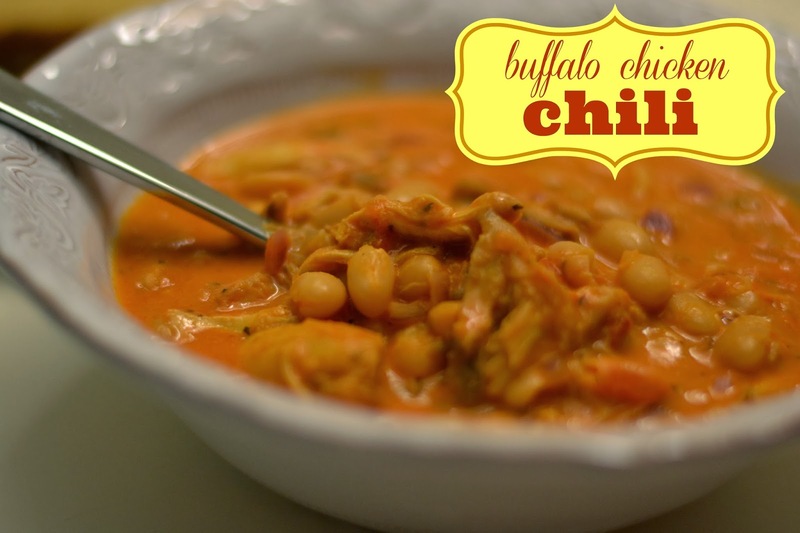 In a soup pot, combine the chicken/onion mixture, beans, remaining package of ranch seasoning, salsa, chicken broth, and more buffalo sauce to taste. Simmer on low until heated through. Before serving, stir in heavy cream to reach your desired consistency. Serve with shredded cheese and sour cream if desired. We went without because it was just full of flavor! I also think chopped avocado would be a great topping. I served grilled cheese sandwiches alongside our chili. The perfect accompaniment! As our due date approaches, I also think I'll be making up a batch of this to separate into large mason jars for freezing. It is so hearty and would make an easy supper once baby is here. Maybe this will be my new go-to for new mamas when we bring them dinner as well! That chili looks delicious. I've always been afraid to cook chili not sure why. This one looks easy and would be great for freezing! Yum!! This looks delicious - I'll have to make it before the weather warms up! Do leave a good inch of space at the top of those ball jars! Sad experience and many popped jars over the years have made me older and wiser. I don't tighten the lids down hard for the freezer either. This looks AMAZING. Anything that's "buffalo" is great in my book! I bet this would be great. Plus, no blue cheese? Even better! We just had shredded buffalo chicken sliders tonight so this would be great for us. Thanks for sharing! That is too funny I made a buffalo chicken soup yesterday for dinner!! I will have to give this a try! I am always looking for new ways to make chili because it is easy and hearty. Up here in Michigan winter will unfortunately be around for awhile so I have plenty of time to still enjoy warm soups. Thanks for sharing!! This might be my new favorite dish...I love Buffalo sauce anything! YUM!